One of the first years that my husband and I were married, we started a little Christmas tradition. At the time, I had dreamt of how fun it would be to do this with a whole family one day, and the last few years that we've been blessed to do so, have been amazing! 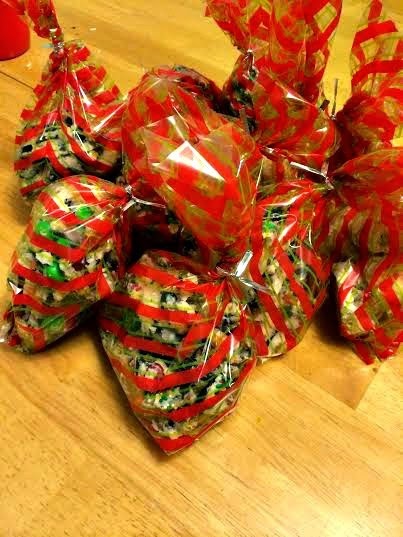 Every year, a week or two before Christmas, we bake a bunch of treats, package them up, and then deliver them to neighbors and loved ones. The fun of it is that it is unannounced and no one is expecting us. We don't hit the same people every year, so it's never like "Oh, it's December 14, the Cooks are coming with treats!" You just never know about us! 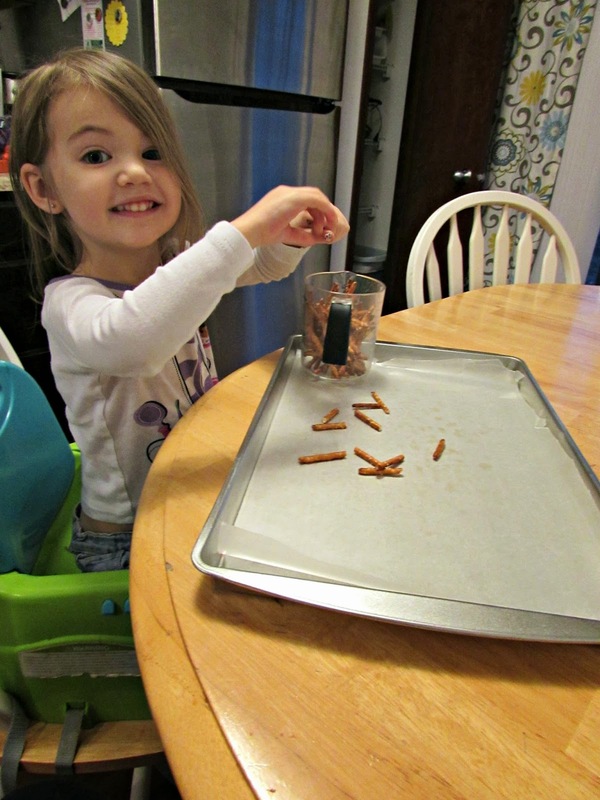 This year, it was pretty much my big girl and I baking. I'm not sure what happened to daddy and little during the baking process, but they disappeared into a bedroom and there were lots of giggles and visits from big sister. She eventually ditched me for them.... The first recipe we did, I found here. 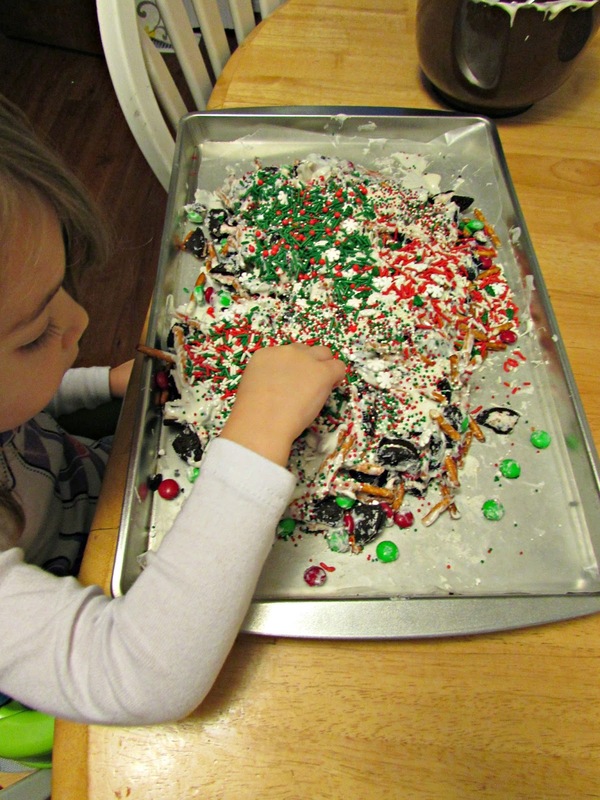 I didn't follow the "recipe" 100%--I felt like it needed a lot more cookies, pretzels and almond bark than what they called for--but we pretty much did the same thing. When I saw it, I thought it would be PERFECT for my toddlers to help because it basically consisted of breaking and dumping stuff! What more could a toddler want?! 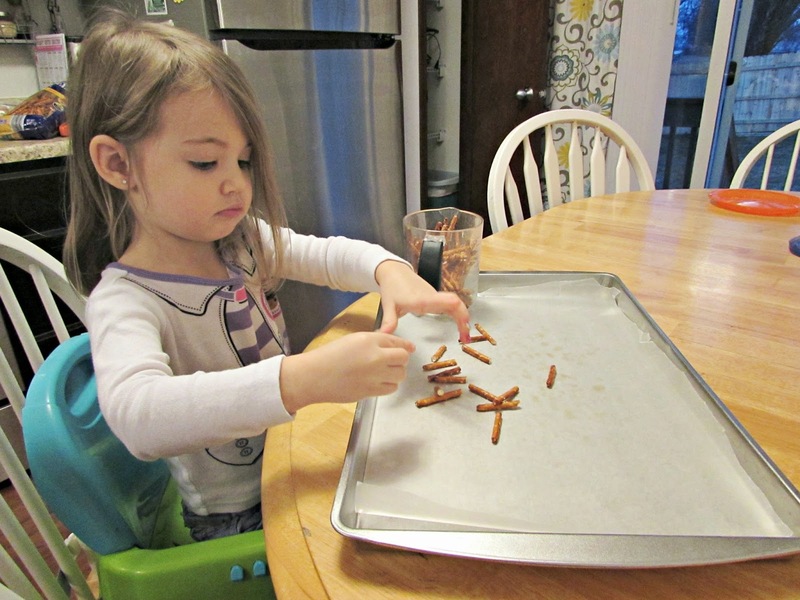 She was in charge of breaking up pretzels, while I worked on breaking cookies since they were a little tougher. I ended up using a package of Christmas knock off Oreos from Aldi and they were so yummy and peppermint-y. They gave the whole thing a ton of flavor! 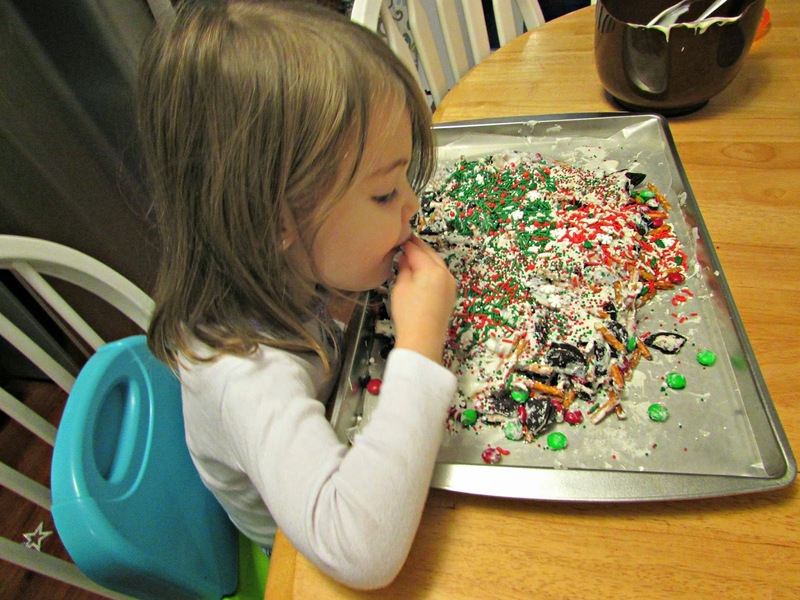 Her favorite part was definitely dumping on sprinkles. She LOVES sprinkles. I got a giant thing of sprinkles from Aldi that had several different kinds of festive sprinkles all in one, and it was the best. She pretty much had me open up one section at a time, then dumped the whole thing out on one little section of goodies, then we moved to the next until we were out of sprinkles. She may have snagged a handful of her own while I was taking pictures. Girlfriend knows what she likes! We also made these. At first they were really weird. The dough was like sand consistency and I felt like it wasn't right, but they rolled into balls fine. Then, I thought they baked a lot longer than normal cookies so I just wasn't sure. When I took them out, I figured we needed to taste test because I didn't want to give people bad cookies, so we did and...they are amazing. Please make them! When we were done, we packaged everything up and went around to neighbors. This year, we did mostly neighbors since we moved this year. It was a great chance to meet some of our neighbors that we hadn't yet! I intended to make a little label so we could leave them on doorsteps if people weren't home and they would know where they came from and that they weren't poisoned, but I never got around to it, so we skipped houses where people didn't answer and just went to ones where they did. Maybe we will try to hit the other houses before Christmas. After neighbors, we loaded up the car and hit up a few family members and friends with what we had left. This is one of my favorite nights of the whole year, every year! There is just something about the season, being in the kitchen, and delivering surprises to people that just exudes joy and happiness! 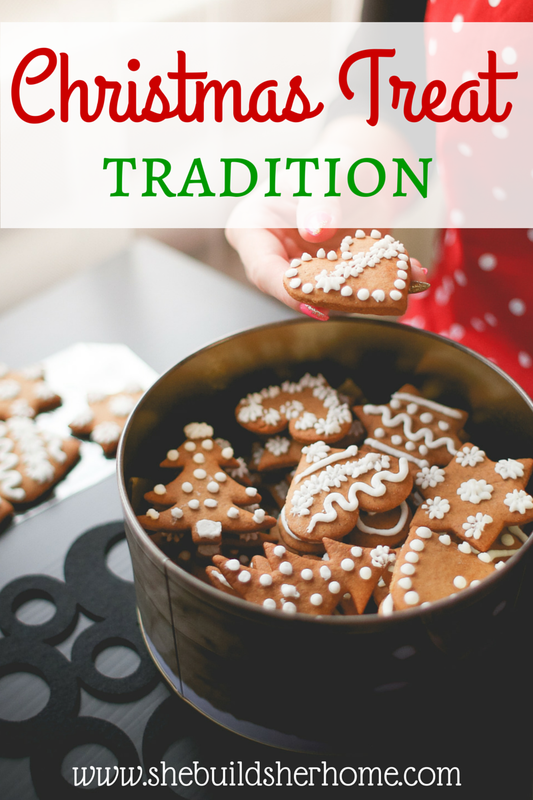 I love this tradition and I hope my kids always think of it when they are grown and look back on Christmas memories from over the years! oh that is so so so sweet!!! i always think i should do stuff like that… but i rarely end up actually handing them out, i just end up eating them hhahaha.